So, WHAT exactly is a hashtag? 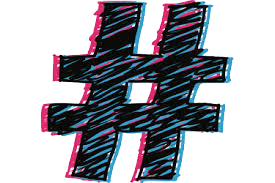 Simply put, a hashtag is the “#” hash symbol preceding any word or unspaced phrase. A couple of examples would be: #blogging or #ThisPostIsAwesome . By adding “#” before the word -or a spaceless group of words – I immediately turn my word or phrase into a clickable link on most social media sites. I can search and sort through any other posts, tweets, etc with the same (or any) hashtag. So, why would you want to use it? Well, think of it as a simple way to categorize or organize things, thoughts, tweets, posts, & threads that have a common topic in the online world. For example, did you know that just recently #JeSuisCharlie was one of the most popular all time hashtags in the history of hashtags (meaning since the creation of Twitter) ? It was a tag people around the world added to their posts and tweets to show their solidarity for the victims of the Paris outrage. It was tweeted 6,500 times a minute and featured in 3.4 million tweets in just one 24 hour period. A hashtag, when used and/or promoted by enough people can “trend” thereby garnering even more attention… even more shares… even more discussion. You don’t have to do anything to create one. Just add the hash symbol before your word or phrase and remember – no spaces. And you can search them from virtually any social media platform. If you want to research one, HashTags.org is a great place to start. Now that I’ve covered the what and why, let me address the when. Obviously, a hashtag is ideal when the subject you’re talking about already has an established hashtag. You can use hashtags to promote, praise or raise awareness about someone or something. SO, here was the whole inspiration behind this blog post. I was having a conversation with my 12 year old about the weather affected our cable and subsequently the internet and during our conversation I said out loud “hashtag first world problems” to which he promptly responded that the word “hashtag” was not to be said out loud. 1.) It is acceptable to use your Hashtag anywhere in your sentence and/or post. 2.) Hashtags are not case sensitive, so #GoForIt . 4.) If you’re doing something to promote your brand, be careful. Hashtags can be hijacked by the masses at any time. Qantas created a contest in which they asked their clients to describe their “dream luxury inflight experience”, in return for a pair of Qantas pajamas and a toiletries kit, only to have users flood the initiative with negative comments. Using the #QantasLuxury hashtag, thousands of users quickly captured the discussion with disparaging comments over the recent shutdown and the airline’s intransigence with unions. 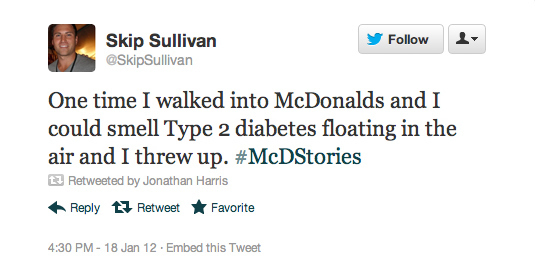 In January of 2012 McDonald’s launched a Twitter campaign using the hashtag #McDStories in the hopes that the campaign would inspire heart-warming stories. Instead, it provided McDonald’s detractors with a platform to use it to share their #HorrorStories. 5.) Don’t swear. Check out this tweet when Chrysler dropped the F bomb. Or so they say and if your outcome is to use hashtags to help improve your SEO, then by all means simpler is better. However, the #Hashtag has become a part of our culture. It’s how we express ourselves. It’s who we are. It’s how we’re feeling. It’s not that I actually expect that anyone is going to go and search for “Having A Bad Hair Day”, but there’s something very real in that… Something raw… Something in the moment… It’s truthful. I love it! It amuses me. 7.) Don’t use the word “hashtag” in everyday conversation. What about you? Seen any good hashtags lately? Got any additional distinctions to add. As always, I’d love to hear from ya.